Read our helpful guide to second hand BMW 123. AA Cars works closely with thousands of UK used car dealers to bring you one of the largest selections of BMW 123 cars on the market. You can also browse BMW dealers to find a second hand car close to you today. 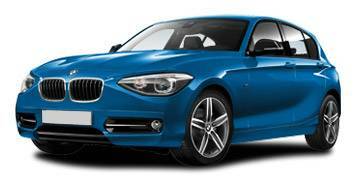 All used BMW 123 on the AA Cars website come with free 12 months breakdown cover. The BMW 1 Series might be an entry-level model BMW, but that should in no way suggest that it isn't a seriously impressive car with the premium feel of the German manufacturer, the same blistering performance, effortless ride and handling as its bigger siblings, yet an approachable price tag and incredibly economic run costs. Nowhere is this better displayed than in the 123, especially the 2.0 litre twin-turbo diesel engine, which offers 54.7mpg returns, 0-60mph in seven seconds and a top speed of 148mph. It might not have the same poise or class as its bigger brothers the 3 Series and the 5 Series, and the 123 might not be as blisteringly powerful as the 135i variant, but it is elegant, fun and a joy to drive.